Advent is a time of contemplation, marked by the spiritual preparation for Christmas, and it becomes more intense the closer Christmas approaches. 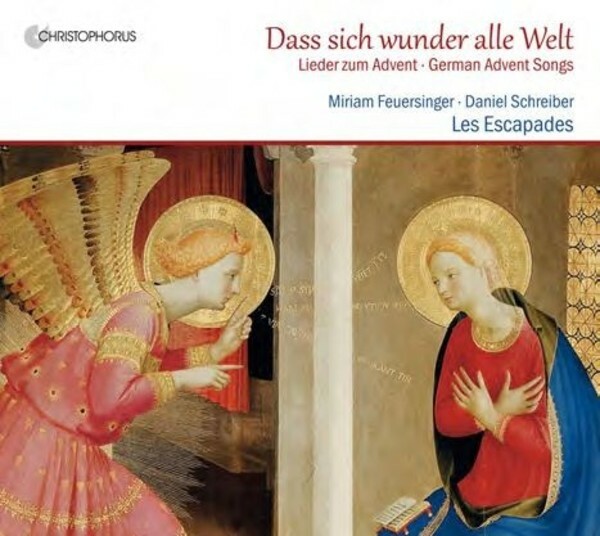 The Latin Introits of the four Advent Sundays form the theological and musical framework of this new CD by the viola da gamba consort Les Escapades. The ensemble has selected well-known Advent songs for it, the verses of which are set by such old masters as Praetorius, Eccard, Lasso and Isaac. They are interpreted in the alternatim practice customary during the Renaissance, making possible a variegated distribution of the parts between gambas and the two vocal soloists Miriam Feuersinger (soprano) and Daniel Schreiber (tenor), thus shedding light on these songs with a wide variety of the finest nuances. The programme is framed by two Christmas cantatas by Johann Rosenm�ller and Franz Tunder, impressively interpreted by Miriam Feuersinger, Echo-Klassik prize winner in 2014.